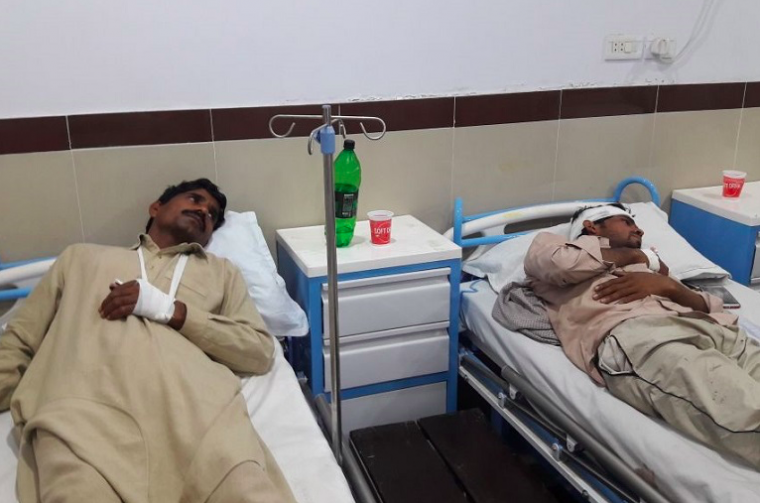 ISLAMABAD, PAKISTAN (BosNewsLife)-- Several Christians in Pakistan's Punjab province were recovering from their injuries Sunday, March 18, after being attacked by an angry mob while building a church wall around an evangelical congregation, Christians said. At least five Christian family members suffered injuries in the March 4 violence outside the Pakistan Gospel Assemblies Church in Yousufwala village, on the outskirts of Sahiwal city, according to villagers. In a statement, the church said that 70-year-old church elder George Masih, who was overseeing masons and laborers constructing the wall, was among those targeted. Masih's two sons, Babar and William, daughter Nasreen, and daughter-in-law Jamila were also injured, according to Christians familiar with the situation. Several Christians were in a hospital with head and arm injuries, pictures showed. Troubles began when worshipers were praying inside the church and heard "shouting and yelling," the church recalled. After rushing outside, Christians saw about 20 men, armed with clubs and axes, beating Masih and other family members. The attackers demanded that the Christians stop the construction, saying the land belongs to them. Christians linked the perpetrators to a landlord. A pastor, who asked not to be named, said the mob also started a fight with worshipers. "Then our women tried to intervene but they too were beaten, and their clothes were torn," the pastor added in published remarks. The violence came amid growing pressure by Muslim hardliners on local Christians and churches, BosNewsLife established. Members of the targeted congregation in Yousufwala say they had permission to build on the land, including a boundary wall. Local police allegedly declined requests for protection during the construction. But after the attack, in an apparent policy shift, the wall was completed under police supervision, BosNewsLife learned. Authorities reportedly asked the church to not file charges against the attackers amid concerns they would increase tensions between Christians and Muslims in the area. The targeted family has also been threatened with charges of "blasphemy against Islam" under Pakistan's controversial blasphemy legislation if they proceed with legal action, Christians said. Rights activists say extremists are using charges of blasphemy against Christians, a minority in mainly Muslim Pakistan, to settle disputes. Several Christians are behind bars including Asia Bibi, a mother of five, who faces the death penalty for blasphemy against Islam. Advocacy group Voice Of the Martyrs Canada (VOMC) urged its supporters to pray for the Christians in the troubled village of Yousufwala. "Please remember this family in your prayers as they recover from their injuries. Pray that the church members will be a testimony of the love and grace of God to others around them, including those involved in this attack," VOMC said.